The Media Browser is a convenient way of accessing and utilizing your media files within Sandvox. So for example, rather than having to load the entire iPhoto application to find a photo, you can use the Media Browser. Click the "Media" button in the toolbar to show the Media Browser. Click the button again to hide the Media Browser. Drop an item onto a page to create an object or insert an image in some text. Drag a media file to the Inspector to set an attribute. Drop an item in the Site Navigator to create a new page. There are four types of media options available in the Media Browser. For each option, Sandvox looks at certain default locations. You can configure Media Browser to look for media in other locations. Hover the mouse over an image to view more information about it. Sandvox supports any audio files that Quicktime can handle. Note though that Protected AAC files will not work; most songs from the iTunes Store are in this format. Sandvox can handle any movie files that Quicktime supports except movies downloaded from the iTunes Store. If you use any movies with an unusual codec, site visitors might have a problem viewing them. 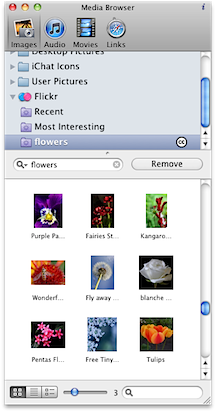 You can "teach" the Media Browser to look for photos, audio files and movie files in other folders as well. Open the Media Browser in Sandvox. Select the "Photos," "Audio" or "Video" section of the browser. Switch to the Finder and begin dragging the folder you wish to add to the Media Browser. While dragging, use the command-tab keyboard shortcut to switch back to Sandvox. Drop the folder in the top pane of the Media Browser. You can flip the Media Inspector over to change its settings. To access the Media Browser's settings, click the "i" button at the top right-hand corner of the window. When you are done, click it again to return to the front of the Media Browser. To browse Aperture images, be sure to have "Share previews with iLife and iWork" checked in the Aperture preferences. (You may need to leave Aperture running for a while after turning this setting on, so it can generate the preview images.) If this doesn't work, you may want to repair your database by holding down the Option and Command keys as you start Aperture.